The Candy Cane Express Train near the V & T Railroad’s F Street Station in historic Virginia City. Two of the legendary mining town’s beautiful churches, dating from the 1870s, can be seen in the background. All aboard the holiday train! 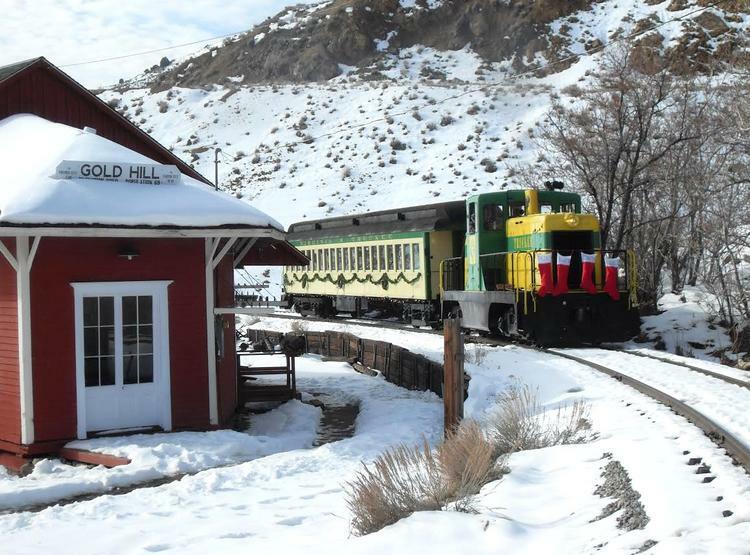 The Virginia & Truckee Railroad will host three week-ends of enchanted holiday trains aboard one-hundred-year old decorated vintage rail coaches, November 25, 26, December 3, 4, 10, and 11. 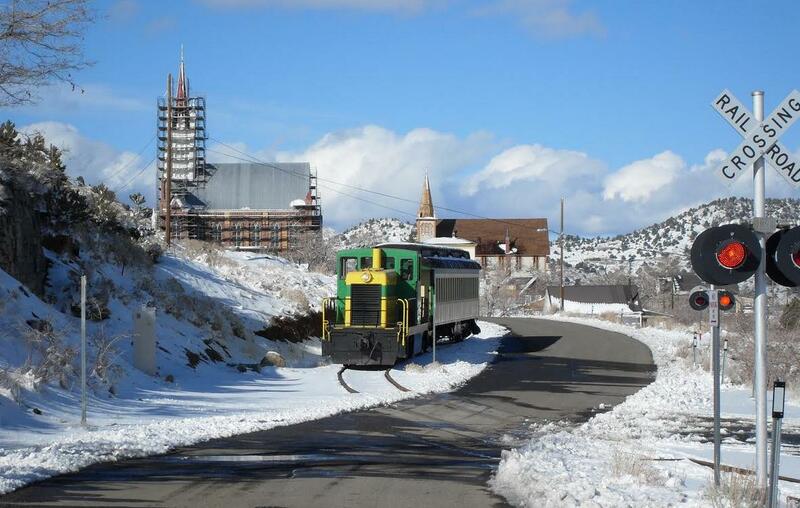 Trains depart from the F Street Station, Virginia City, NV, at 12 noon and 2pm. The Night Before Christmas holiday narrative. The North Pole “Candy Cane Sisters” will record children’s wishes for Santa deliveries, with special North Pole sing-a-longs that delight both the young and young-at-heart during the 50-minute ride though Nevada’s high desert wonderland. The Virginia and Truckee Railroad’s Candy Cane Express Train passing by the historic Gold Hill depot. “Dear Santa” postcards will be distributed on all trains and can be posted for special delivery to the North Pole daily at the depot. Departures leave promptly from the F Street Station, Virginia City, NV, at 12 noon and 2 pm. Please arrive fifteen (15) minutes prior to designated train departure time. Cost: Adults (12 years +) $19; Children ( 2-11 years) $8; Children under two may ride Free on adult lap.